The Food Empowerment Project recently filed a Freedom of Information Act request with the USDA’s Food Safety and Inspection Service (FSIS) on behalf of the Rabbit Advocacy Network (RAN). The FOIA request was for a copy of the inspection reports for the slaughterhouse in Jewell, Iowa operated by Iowa Rabbit, LLC, the company which provides much of the rabbit meat to Whole Foods. We received a report dating from January 1, 2014, when operations at that slaughterhouse began, through July 22. RAN’s volunteers have already documented the conditions under which these rabbits, which are sourced from breeders throughout Iowa who respond to ads the company places in newsletters, are raised, which Whole Foods calls humane, but which are massively inconsistent with how rabbit care experts care for their rabbits. We wanted to find out more about the conditions under which the rabbits–America’s third most popular furry pet–now being slaughtered for sale at Whole Foods stores across the country are dying. We know that these rabbits have their throats slit, after being stunned with a non-penetrating captive bolt gun, and then they are bled out, before they are skinned. We have compiled the research on this method of stunning, and the problems it poses for rabbits here and have found that in many cases, rabbits are still conscious after stunning. The USDA inspection report, although heavily redacted, provided more information. Even though USDA inspectors are not on site at slaughterhouses to ensure that animals being slaughtered are killed humanely, but to ensure that the meat produced is safe for the public–that’s why they work for the Food Safety and Inspection Service–they do note in their reports a few things that should give people worried about animal welfare pause. While the report omits slaughter totals, because it is “proprietary information,” (but according to a veterinarian who works for W&G, the company which owns Iowa Rabbit, the plant was slaughtering 1500 rabbits per week in 2012; that number is most likely higher today) it does note the totals of rabbits who died before they could be slaughtered. This includes rabbits who died during transport known as DOA (dead on arrival) and rabbits who died while awaiting slaughter (rabbits wait, crowded in their transport cages, for up to three days until they are killed) known as DIY (died in yard). Because the one federal law that protects livestock being transported to slaughter, the Twenty-Eight Hour Law (which provides minimum safety and care requirements) does not cover poultry, which rabbits are considered by the USDA, it’s not surprising that we should find that rabbits would not survive transport–even just within Iowa. 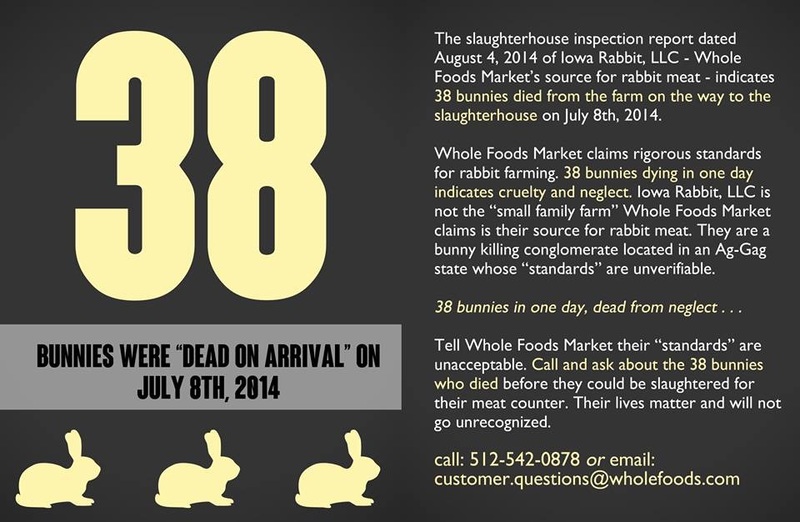 For instance, on a single day in July, 38 rabbits arrived dead in the facility. In addition, baby rabbits, called “fryers” by the industry, arrive at the slaughterhouse, and may sometimes wait for a few days to a week before they are slaughtered. (The parents, after years of breeding the babies, once they are used up are slaughtered as “roasters.”) Again, there are no minimum standards for their care while they await death so it shouldn’t surprise us that many perish, in the same overcrowded transport cages in which they arrived, before their slaughter day arrives. One March day, 30 rabbits died at Iowa LLC while in their cages. Finally, quite a few rabbits in our report were classified by the USDA inspector as “condemned,” which means that they were determined to be too sick for consumption. Most days there were at least a couple of rabbits who were condemned; these rabbits were then killed, and their bodies discarded, because the conditions in which they were raised or transported were too brutal. What we do know from all of the evidence that we have uncovered is that the rabbits being sold for food at Whole Foods Market are not being humanely raised nor killed. The animal lovers whom Rabbit Advocacy Network represents are asking all animal lovers to join us in our fight to stop Whole Foods from adding one more animal to their meat cases.